We are pleased to announce that in March 2-7, 2016 Zochrot and a number of US solidarity groups will present the first-ever 1948mm in the US: Zochrot Film Festival on Nakba and the Right of Return, in its 4th year in Palestine/Israel. Zochrot (the female form of "remembering" in Hebrew) is an NGO working since 2002 to promote acknowledgement and accountability for the ongoing injustices of the Nakba (Arabic word meaning “catastrophe”) of 1948 that began with more than 700,000 Palestinians expelled and 601 localities destroyed. Zochrot promotes the reconceptualization of the Return of refugees as the imperative redress and a chance for a better life for all the country's inhabitants. 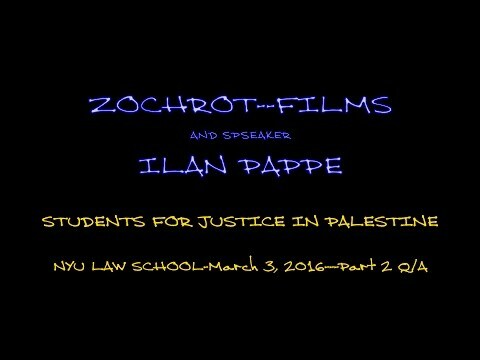 Four universities will host screenings of films by Palestinians and Israelis and discussions for students and community members: New York University (SJP), Brooklyn College (SJP), Columbia University (SJP). Additionally, NYU's Hagop Kevorkian Center will host screenings of films and discussions. Please donate to support the festival! We need funds to print the incredible poster by Sarah Sills and to compensate filmmakers and speakers whenever possible! Cosponsors of 1948mm: Zochrot; Students for Justice in Palestine at Columbia, Brooklyn College, NYU and NYU Law; Jewish Voice for Peace NYC, Columbia/Barnard, and; Jews for Palestinian Right of Return; Jews Say No!; Facing the Nakba; Awda NY: The Palestine Right to Return Coalition; Middle East Crisis Response; Tree of Life Educational Fund; NYU Gallatin School of Individualized Study and NYU Hagop Kevorkian Center. 8:30 PM - "On The Side of The Road"
Followed by conversation with the director Lia Tarachansky via skype. 3pm - "The Wanted 18"
Followed by conversation with the director Amer Shomali via skype. 5pm - "A World Not Ours"
10 min. Hebrew with English subtitles. Jewish Israeli grandparents are challenged by their grandchild to compose an agreed-upon version of the untold story of a large crystal mirror, taken from the destroyed Palestinian village of Zarnuqa. An intimate discussion that reflects on the presence of the Nakba in the lives of Jewish Israelis and addresses its silenced remnants, located at the very center of our lives. *Winner of the Van Leer Award for Best Short Documentary Film, Jerusalem Film Festival and the Grand Jury Prize in Short Competition at DOC NYC Documentary Film Festival. Screened in leading film festivals around the world, including Palm Springs Short Film Fest, Warsaw Film Festival, San Francisco Jewish Film Festival, Kassel Short Fest, Flickerfest Short Film Festival in Sydney, Australia and Palestine Film Festivals in London, Ann Arbor and Chicago. A Palestinian refugee returns to visit his destroyed village near Ramle in 1969, and is filmed for an Israeli documentary. Thirty years later, in a different documentary but in a remarkably similar scene, a refugee visits his village again. By an amazing coincidence, they turn out to be the same person: Abu-Muhammad from the village of ‛Anaba. The film returns to these documentaries through the eyes of their directors, Ram Levi and Ra’anan Alexandrovich. Could the return scene be filmed for the third time? 12 min. Hebrew with English subtitles. Taboo - Social prohibition against names, activities, people and conversation subjects considered undesirable. Violating a taboo is seen as a despicable act. Tabu – Property title deed. When the house and its tenants want to tell a story but are silenced by the taboo, objects have to speak in their stead. A house turns into a tile, a landlord into a lock and a meeting into a cup of tea. Yussuf Hassan is a refugee from Wadi Salib neighborhood in Haifa. His wife Amna Hassan is a refugee from the village of Yassur in the south. They live peacefully in a shack in Wadi Rushmiya, in the outskirts of Haifa, with radio news bulletins being their only source of information about the outside world. Nobody bothered to notify them that the municipality had decided to pave a highway across the riverbed that is their home. They refuse to be evacuated and consider their displacement from their natural environment a second expulsion. The movie focuses on the third generation of the Nakba and their dilemmas around their Palestinian identity, to the point of fear of losing it. Seventeen year-old Muna Thaher, the granddaughter of Abu-‛Arab, a refugee from Safuriyya, takes us on a voyage in search of the reasons for the split in Palestinian identity and its fragmentation among youths who now define themselves as Israelis. Along the way, Muna recounts the history of her family’s displacement from the village in the Galilee, as bequeathed by her grandfather across the generations. Inspired by a day in the life of Palestinian painter Ismail Shammout (1930-2006), Ismail tells the compelling story of a young Palestinian struggling to support his parents after their expulsion to a refugee camp in 1948. When the government tried to silence a history, a light was shed on the nation's biggest taboo. On The Side Of The Road is the story of those who fought to erase Palestine and created an Israeli landscape of denial and of those who fight to reveal it. Palestinian Oscar candidate for Best Foreign Film, 2015. A World Not Ours is an intimate, humorous portrait of life in the Ain al-Hilweh refugee camp in southern Lebanon. Based on a wealth of personal recordings, family archives, and historical footage, the film is an illuminating study of belonging, friendship, and family.